Water restrictions have left many gardens suffering and it is important to find ways to effectively care for them while still saving water and money. 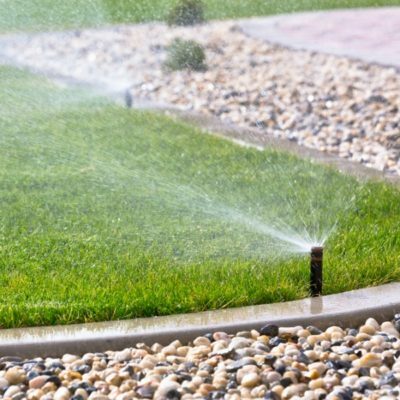 Here at BlueStone Landscape Construction, we are experts when it comes to irrigation and sprinkler systems in Bendigo. We can install a wide range of solutions to suit your needs for your garden and lawn while sticking within your budget. No matter how big or small the task, we complete each project with the utmost professionalism. Whether you need us to prepare and install tanks or install a great automatic system, you’re guaranteed to give your garden the best care once we are finished. To prevent evaporation, we can also install dripper systems, which are a great solution for those who are water conscious. If you’re unsure as to which sprinkler system would best suit your property size, shape, or design, allow our team to offer their expertise and make suggestions as needed. As structural landscaping experts, we have the ability and the speciality equipment at our disposal to accommodate a variety of landscape requirements. Whether you needed professional paving or a new concrete retaining wall installed, we are more than capable of completing such tasks to the highest possible standard. It is our goal to offer a complete landscaping overhaul, allowing our clients to pick and choose from our array of skills and services. We can also offer Bobcat services for tackle those more challenging projects. Make sure your garden is getting the attention it needs and contact us today. If you would like to learn more about this particular service and how we can help you care for you garden, please get in touch with our team today on 0400 078 913. Alternatively, you can also request a quote using our online form and we will get back to you.